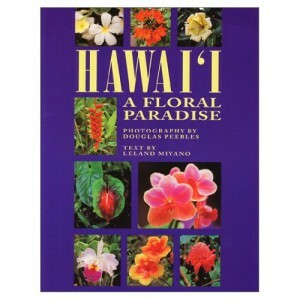 Awhile back I was at a local yard sale and I picked up a book called Hawai’i A Floral Paradise by Leland Miyano. When I started flipping through the book I knew instantly I had to buy it. It instantly took me back to Hawaii. Which coincidentally when we first saw our house and the tropical plants all over in the back yard reminded me of Hawaii and I was hooked and wanted it too. Hawaii has a warm spot in my soul. 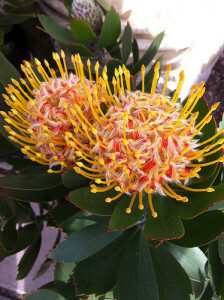 Tuesday, I got a tip that Cedros Gardens in Solana Beach has Leucospermum or Pincushion protea which my book describes as looking like red sea urchins, which is dead on. When I got to CG I was delighted to find the plant below. Well I am going to have to save up to buy it. The good size plant was $149.00. These are native to South Africa and Australia. 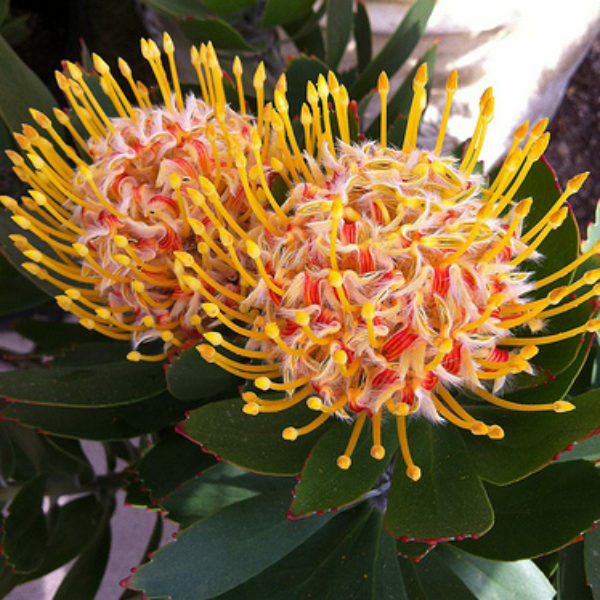 Grevellea Banksii, is also called the Kahili Flower. I have another favorite Kahili flower which is Kahili Ginger. It is rampant in my yards. 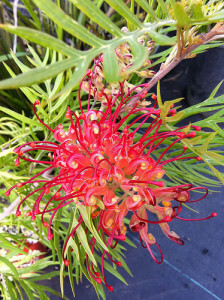 I came home with Grevillea, which I am told hummingbirds love, so the ones that frequent my yard will be happy. This exotic flower also had a smaller price tag of only $15.00. Well, I will be saving up for my Protea. 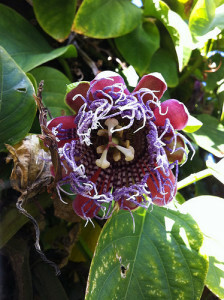 And I also want a Purple Passion Flower vine like this. But I may opt for the edible variety, I just love Lilikoi juice.